With 125 engaging, 10- to 15-minute lessons, writing skills are introduced on Day 1 and progress in difficulty until students apply what they've learned to a writing prompt on Day 5. 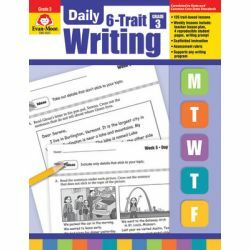 Activities break writing down into specific, approachable skills that allow even struggling students to practice writing without feeling intimidated or overwhelmed. 160 pages.